Although the Rare Book Week West crowds have shifted north by now, opening this weekend at the Huntington Library in San Marino is an exhibition of seven recent paintings by contemporary British artist Celia Paul, one of which is bound to captivate the Brontëans among us. The Brontë Parsonage (with Charlotte's Pine and Emily's Path to the Moors) has its roots in Paul's recollection of her childhood home near Brontë's Parsonage. Hilton Als, prize-winning art critic and curator of this exhibition, speculates "that Paul might have seen parallels between the Brontë family and her own, many members of whom have been involved in the Church of England," according to a statement released by the Huntington. The exhibition, which remains on view through July 8, also showcases Paul's light-filled seascapes and contemplative portraits of family members. 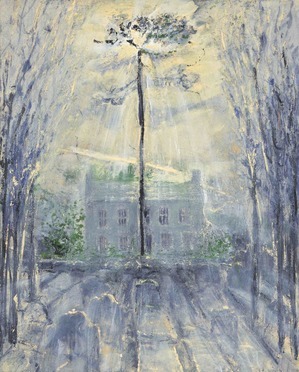 Catherine Hess, chief curator of European art at the Huntington, said, "With Turner's masterful brushwork and Constable's sensitive treatment of light and climate as a backdrop here, our visitors can assess Celia Paul's work within the context of British painting, while also appreciating the innovations and sensitive introspection of this 21st-century female painter." Image: Celia Paul, The Brontë Parsonage (with Charlotte's Pine and Emily's Path to the Moors), 2017. Oil on canvas, 36 1/8 x 29 1/4 in. © Celia Paul. Courtesy of the artist and Victoria Miro, London / Venice.